I’ve written about the coming zombiepocalypse before in these pages. If you missed it here, then you’ve probably seen something about it on television or at the movies. There are so many TV shows and movies about zombies that it’s hard not to think that the walking dead are going to overwhelm our cities, suburbs, towns, farmsteads, and campsites at any moment. Hollywood, in their wisdom, has been preparing us for the zombiepocalypse for years. And it’s paid off, because the z-poc is now! What, you haven’t seen the supernaturally-reanimated traipsing around your local shopping arcade and/or Farmer’s Market? Well, true. No comets appeared in the sky shedding strange cosmic dust to reanimate the recently deceased. No secret government mad science experiments have gotten into the wrong hands (not that we know of anyway). No aliens have hovered above our cemeteries, raising armies of the dead to use in world conquest. And, as far as I know, no Nazi zombies are currently harassing any ski bunnies on the slopes in Colorado, Switzerland, or elsewhere (zombie Nazis + snow + snow bunnies = the movie “Dead Snow”). Yet the zombiepocalypse is upon us anyway, in the form of the Occupy Movement. 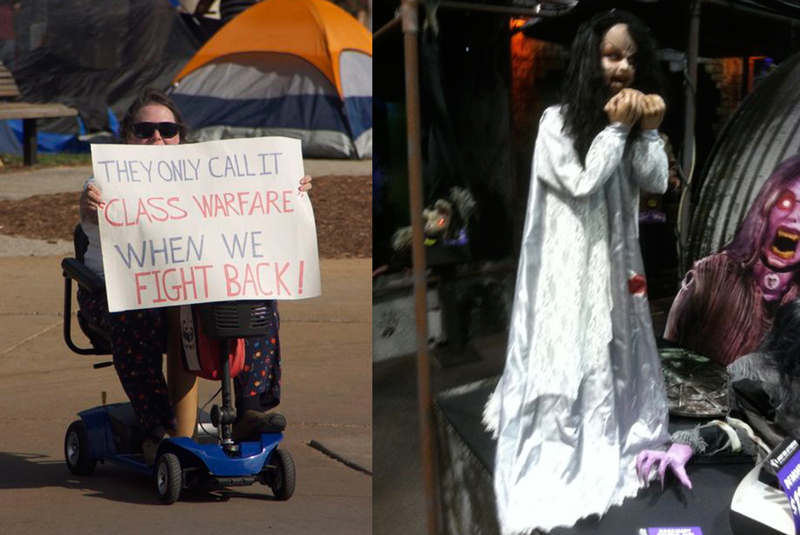 Left: An Occupier occupying St. Louis; Right: A zombie. Now, just wait a minute. I don’t mean what you think I mean. For those of you nodding your heads and saying, “Yeah, bunch ‘o hippie zombies, that’s what those no-goods are!”, no, I don’t mean that. And for those of you saying, “How dare you compare those agents of change, those crusaders of righteousness, to mindless, shambling zombies,” that’s not what I mean, either. From Hollywood, independent filmmakers (especially here in Springfield, the Middle West, which I firmly believe is the independent films about zombie capitol of the US), books, comics, comics-made-into-TV-series, and History Channel documentaries, we know a great deal about zombies. From Fox News, CNN, and other media coverage, we don’t know quite as much about the Occupiers, other than that they carry signs, like tents, and are fond of math, but if we scour the intertubewebs, the newspapers, and our Twitter feeds, we can still put together a more-or-less comprehensive composite. So let’s take a look for a moment at the Zombie and the Occupiers and see if we can find a convergence. The greatest single defining trait of zombies is not that they are dead. That’s a misconception. There are a number of movies (“28 Days Later” and, erm, some others) wherein the zombies aren’t reanimated corpses, but rather people driven to a rage by some form of external influence (Oh! “The Crazies” — that’s another one). No, the single defining trait of zombies is that they want to eat brains. Not cow brains, which is a dish called sauteed cerveaux in French and can therefore be found at the more upscale French restaurants and other like-minded places where you won’t find me. No, zombies want fresh human brains. Well, apparently so do the Occupiers. They claim to want people to think about the system — how it works; how it fails — and figure out how to fix the parts that are failing. They also want the people who are part of the overclass to rethink how the failures of the process affect the populace at large. So, okay, maybe the Occupiers don’t want to actually eat brains, but they do want to possess other people’s brains and get them to think differently about, y’know, stuff. Hmm, speaking of rage induced by some form of external influence, I’d say we can call that a match, too (the banking system, anyone?). Zombies infect those they come in contact with, thereby increasing their numbers exponentially. As for the Occupiers, well, they started out occupying Wall Street. Then their ideas began to spread (infected, depending on your world-view) others around the country. Soon enough there was Occupy San Francisco, Occupy St. Louis, Occupy This and Occupy That. At this rate, it can’t be long before there’s an Occupy Fargo and an Occupy the Grand Canyon. Occupiers everywhere. Zombies are considered mindless (even though the only way to kill them is by destroying their brains–which seems a bit ironic). Listen to any Conservative talk show outlet for very long and you’ll find that there are certainly those out there who consider the Occupiers to be ‘mindless’ as well (although I believe “idiots” is the term actually used). But, beyond that, one of the primary indictments of the Occupy Movement is that it doesn’t seem to have a plan, other than a vague “We need to effect change” kinda plan. Without a plan, the Occupiers can easily be seen as a (zombie) horde, mindlessly seeking destruction without consideration for what needs to be erected in the face of that anarchy. So the zombiepocalypse has arrived; it just isn’t exactly what we were expecting. After all, if I saw some of those George Romero zombies shambling toward me, I’d know for sure I needed to run away from them rather than sit down and have a chat over some tea or Starbuck’s coffee. Oh, by the way, let’s be clear here: I’m not advocating that you go out and hit an Occupier over the head with a spiked baseball bat. But if you see a zombie Nazi in the snow? Go for it. This entry was posted in Observation Deck and tagged banking system, Dead Snow, Nazi Zombies, Occupiers as zombies, Occupy Movement, snow bunnies, spiked baseball bats, zombie, zombiepocalypse. Bookmark the permalink.